I mentioned in last night’s post that we butchered a few more of the roosters, which, as I mentioned in this post, was our plan for all the roosters Fate saw fit to give us. As a farmer’s daughter, the concept of butchering the roosters for meat is not a foreign one for me. It kind of was for Little Dude, though, and he spent some time after the first round of butchery being sad because the chicks he raised were gone. He did better with round two, and was only a little sad this time. Instead, it was his chicken, Double Dots, or as we sometimes call him – Dots – who seems to be sad. He didn’t seem to really notice the last time (two weeks ago) when ten of the ‘brothers’ vanished. 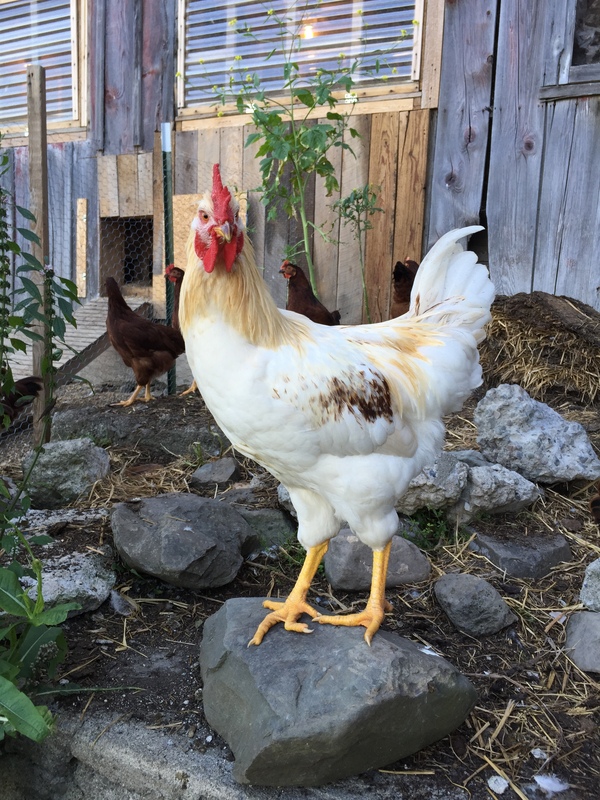 That was two weeks ago, and well… he’s two weeks older, two weeks closer to being a matured rooster. I didn’t notice too much difference on Sunday, but after the butchering we kept the chickens confined to the run and coop, not allowing them to wander in the barnyard because I didn’t want them to get into any remaining blood and feathers, if there were any. DH and Dad cleaned up their space as best they could, too. But this morning, the first thing Dots did was go straight to the spot where they had done the skinning and picked up the feathers, one at a time, scratching the ground and clucking and grumbling. He spent the rest of the day pacing around, crowing and crowing and waiting for someone to answer him. That was their game – him and his sexlink brothers – they would split up into groups and wander around the barnyard and crow loud Rr-RrRr-Rr-Rr to each other. Like hide and seek. He also kept a close eye on the other chicken all day day, and even freaked out TOTALLY when one of the sexlink hens he grew up with wandered off around the front of the barn by herself. I mean, literally freaked out. I had to go find her and show her to him before he’d let the other chickens out of the coop. He was seriously standing in front of the door to the run, so none of the others could go outside, and kept looking around like he was taking a mental tally of who was there. At dinner time,I found him sitting in one of the beds in the coop, clucking and fussing and basically acting upset over something. I truly believe that he misses his brothers and is searching for them. Gonna keep a close eye on him the next couple of days, because I wasn’t expecting this reaction. It didn’t happen the last time… and we have one more round of butchering to get through yet. he is! make sure he has some friends ……. Our plan was to butcher all the Roos except Dots and leave him with the hens. There are 16 of those, so he shouldn’t be lonely, right? Although… the hens won’t Rr-Rr-Rr with him. Dad and I, and Little Dude do, when we are down in the barn and barn yard. If he crows, I crow back so he knows I’m there for him. I suppose it’s not the same as a brother. that sounds fine, but maybe put him in with the hens now, so he’s got a distraction when he loses all the others he grew up with? Oh, they all live together now. We never separated the roosters from the hens or anything. I just kept the younger flock separate until they were big enough to integrate without harm coming to them. Dots is one of the older ones, my first flock, and he’s got 3 hens left he grew up with. All the rest are the Reds now. But like I said, they all live together in the same space now. sorry, I misunderstood – but its natural for him to miss the ones he grew up with! Yes, I think it is! He let the others do more exploring today, although the one sexlink hen did wander off again and he did freak out over her again. Little Dude and I hunted her down for him twice.